Italy players celebrate after scoring a try against South Africa at the Stadio Artemio Franchi in Florence yesterday. Italy claimed their first-ever victory over South Africa with a nail-biting 20-18 success in Florence, yesterday. South Africa had won the previous 12 games between the two countries and were ahead inside five minutes as the returning Bryan Habana finished Willie le Roux’s clean break. But Italy were soon ahead when Andries van Schalkwyk crashed over from a rolling maul and Carlo Canna converted. Damian De Allende’s converted try regained the lead for South Africa, who were 12-10 ahead at the break following an Edoardo Padovani penalty. 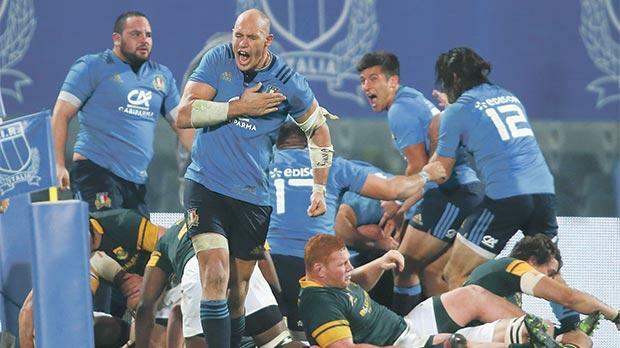 Italy were reduced to 14 men at the start of the second half by Marco Fuser’s yellow card and a Patrick Lambie penalty gave the Springboks a five-point lead. But Giovanbattista Venditti’s converted try put Italy 17-15 ahead, and the Azzurri held on for a famous victory after Elton Jantjies and Canna exchanged penalties in the final quarter. Replacement flyhalf Sam Davies’s last-gasp drop goal gave Wales a 33-30 win over a feisty Japan side in a thrilling test at the Principality stadium. Wales were given a big fright when replacement back Amanaki Lotoahea raced down the right wing for a try which flyhalf Yu Tamura converted to put the 2019 World Cup hosts level with five minutes remaining. The Welsh were indebted to 15 points from the boot of Leigh Halfpenny as they were never allowed a breather by a Japan side who hit back every time the hosts looked like pulling away. Flanker Dan Lydiate, centre Jamie Roberts and captain Sam Warburton went over for Wales while Japan’s first two tries were scored by wingers Akihito Yamada and Kenki Fukuoka. Other results: England vs Fiji 58-15; Ireland vs New Zealand 9-21; Scotland vs Argentina 19-16.